Cordless Phones Emit How Much Electromagnetic Radiation? How far does the RF radiation from your DECT cordless phone reach inside your home and how strong is it. A real-life study performed by us with a DECT cordless phone provides us with some answers. The paper was presented at the EMF Workshop in Rhodes, Greece in 2002. 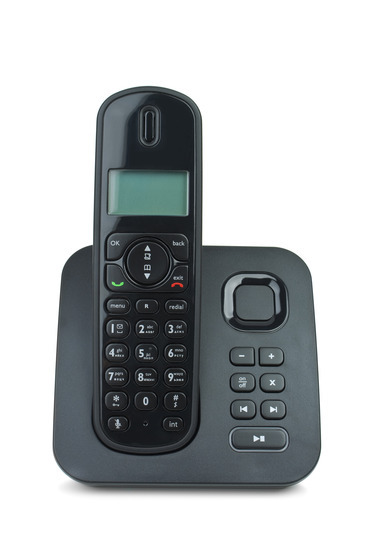 The use of DECT (Digital Enhanced Cordless Telecommunication) cordless phones has been a major health and environmental concern in Europe and especially in Germany for years. The biological concern arose from studies on HF (high frequency) sources such as GSM cellular phones and towers. Digital cordless phones are also available in the USA – marketed as 2.4 GHz digital technology. 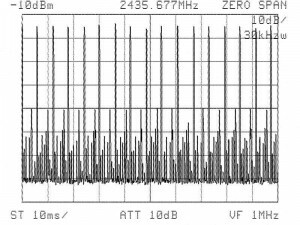 A digital cordless phone was placed in a representative private home in California and HF measurements were conducted at different locations inside, using frequency selective spectrum analysis to obtain the cordless phone power densities. The results showed that the radiation patterns and levels emitted by the small cordless phone base station are almost identical to the DECT technology – also digitally pulsed and permanent microwave radiation. The power density values presented for each room inside the home can be compared to average DECT cordless phone radiation exposures found in German homes. The maximum power density was found to be over 500,000 µW/m2 at a normally encountered distance (about 1 – 2 feet) if the base station is placed on an office desk or bedside table. The radiation peak values in the same room are higher than those encountered in proximity to cellular base stations located near residential buildings. DECT cordless phones usage has been a major health and environmental concern in Europe and especially in Germany for years. Now multiple handsets cordless phones are also available in the USA – extolled as 2.4 GHz digital technology with multiple handsets following the DFHSS (Digital Frequency Hopping Spread Spectrum) standard which is almost identical to DECT. The biological concern arose from studies on high frequency (HF) sources such as cellular phones and cellular phone base stations with GSM technology. 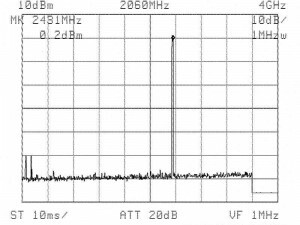 The digital pulsed pattern of GSM and DECT radiation has come under suspicion to cause e.g. brain cancer, lymphoma, and changes in the brain blood barrier. The problem with the cordless DECT phones is, that the base station permanently emits full power pulsed microwave radiation, whether the phone is used or not. This creates constant exposure to high levels of the most critical type of HF radiation known throughout the entire home or office. The DECT technology is a European standard for cordless phones in the range of microwave radiation (1.8 to 1.9 Gigahertz, GHz). Identical permanently emitting portable phones with the special option of multiple handsets are available in the US and therefore the exposure issues are relevant for US population. In the US, the cordless phone manufacturers established the 2.4 GHz digital pulsed technology in the range of 2.4 – 2.5 GHz. Cordless phones such as e.g. the GIGASET (same name as a DECT cordless phone series by the same manufacturer in Germany) are available in USA. A GIGASET cordless phone model was selected as a representative DFHSS 2.4 GHz phone for typical home and office usage. The base station was purchased in the US and placed on a wooden office desk in a representative 3 bedroom residential building in California. In the first test set, the power density in the room was measured prior to the activation of the base station to obtain background levels at the test site. Power density measurements were performed at different distances and directions from the phone (see table 1 and 2) with an Advantest R4131C spectrum analyzer (Rohde & Schwarz) and a calibrated periodic logarithmic log.per. antenna UKLP 9140-A (Schwarzbeck). The power density measurements were conducted under real-life conditions and only peak values (pulse maximum) were measured. All measurements were conducted following VDB guideline (VDB 2002) and the Swiss BUWAL guideline (BUWAL 2002). The power density levels are given in µW/m2 (microwatt per square meter). 1 µW/m2 equals 0.1 nW/cm2 (nanowatt per square centimeter). 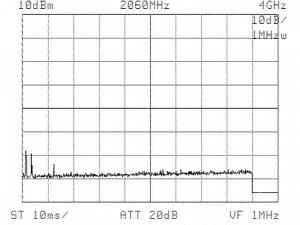 The background level was <0.3 µW/m2 (-58 dBm) in the range of all wireless, analogue or digital cordless, and cellular phone applications (0.3 to 3.5 GHz). See figure 1. High frequency measurements were conducted and showed that the radiation patterns and levels emitted by GIGASET 2.4 GHz cordless phone base station are identical to the DECT technology – also digitally pulsed with permanent microwave radiation. For comparison, the radiation levels from the GIGASET located in the same room are even higher than encountered in proximity (50 to 100 feet) to most cellular base station located on pole mount positions or on top of office buildings. However, in this case the source of the radiation is a desktop personal cordless phone. 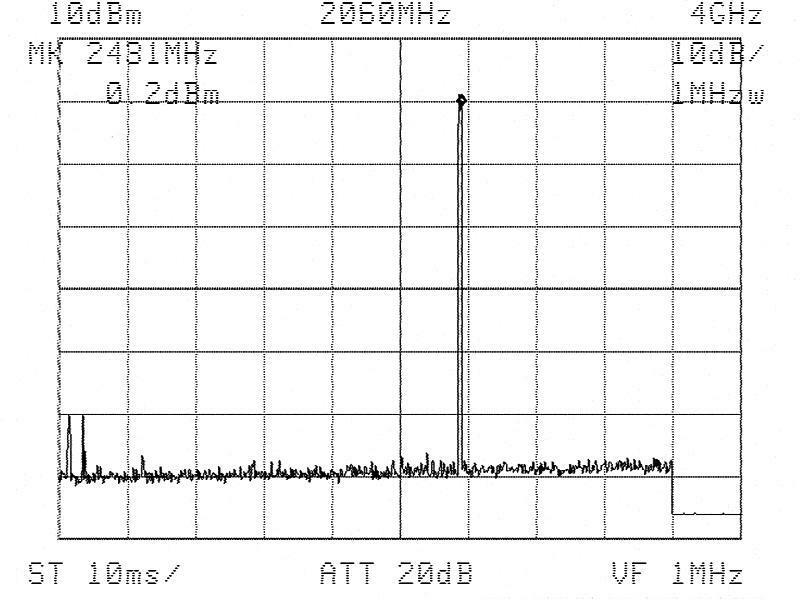 Besides the permanent emission from such a base station, the pulsed nature of the signal was analyzed and is displayed in figure 3. The spectrogram shows the periodic pulsed signal. The dynamic range of the power density covers the full range scale from minimum (pause) to maximum (pulse) and is sending out pulses every 10 milliseconds (ms) or 100 Hz (Hertz). The levels encountered are considerably high for an indoor source, which emits permanently. The radiation peak values in the same room are higher than those encountered in proximity to cellular base stations located at pole mount or roof top positions. 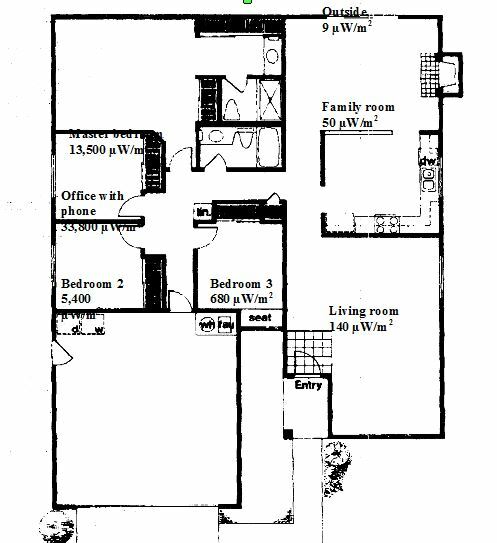 Even in the master bedroom and in the second bedroom, the power density levels were in the range of or above the 95. percentile radiation level just recently obtained from a study of cellular phone tower measurements in residential areas (HAUMANN 2002). For comparison, thermal (guidelines), other non-thermal (recommendations), and cellular tower exposure reference values are listed in the table 3 below. Many European researcher, physicians, environmental professionals and toxicologist signed a resolution requesting the immediate stop of the DECT technology. This petition was delivered to the Germany Environmental Minister Mr. Jürgen Trittin in October of 1999 (Resolution 1999). The Germany magazine “Oeko-Test” (equivalent to the US magazine Consumer Test) had 16 DECT cordless phones tested, published the measurement results, and rated all phones as not recommendable due to the constant emission of high levels of pulsed radiation (Oeko-Test 1999). Pulsed HF radiation, which is reported to be more bioactive than constant wave HF radiation. The human body reacts much more complex than acknowledged in the thermal model and is very sensitive to extreme periodic stimuli. The biological system takes the “energy” as well as the “information” which is brought e.g. by the continuous pulsed modulation pattern. Neurogenetic effects and micronuclei formation in peritoneal macrophage. In this review study, a threshold of 1000 µW/m2 was evaluated for non-thermal biological effects. For locations with any long-term exposure, a further safety factor of 10 was recommended for pulsed cellular phone radiation sources as cellular phone base stations. In this case, the power densities should not exceed 100 µW/m2. The constant High-Tec HF radiation brought into the US homes and offices by 2.4 GHz digital technology cordless phones is definitely a big step in the wrong direction in terms of environmental health protection and radiation exposure prevention. This reveals a complete misunderstanding of progress for our new millennium. If you would like to learn more about detection and shielding of electromagnetic radiation exposure from cordless phones or other devices, call the experts at EMFRF Solutions to have your location tested and advice on how to properly shield from EMF or RF radiation. Call 760-942-9400 Today! MAES 2000 Maes W., Stress durch Strom und Strahlung, 4. Ed. 2000, Verlag Institut für Baubiologie und Oekologie IBN, Neubeuern, Germany. Oeko-Test 1999 Test “Schnurlose Telefone”, Öko-Test 11/1999 Germany, November 1999. Oeko-Test 2001 Test “Mobilfunk-Sendeanlagen”, Öko-Test 4/2001 Germany, April 2001, pp. 32 – 40. Resolution 1999 Resolution for Bundesumweltminister Trittin, Germany, delivered on 19.10.1999 during the event “Buergerforum Elektrosmog” organized from the Bundesministerium für Umwelt, Naturschutz und Reaktorsicherheit in Bonn, Germany. SBM 2000 Baubiologie Maes and IBN, Standard der Baubiologischen Messtechnik SBM 2000, Richtwerte für Schlaf­bereiche, in “Stress durch Strom und Strahlung”, Maes W., 4th Ed. 2000, pp. 542 – 545, Verlag Institut für Baubiologie und Oekologie IBN, Neubeuern, Germany.